Blow-drying your hair, getting the barbecue going, accelerating on a swivel chair… there are so many things you can do with a leaf blower, but do not necessarily actually have to. You could of course use it, as the name suggests, for clearing autumn leaves off open ground and paths. 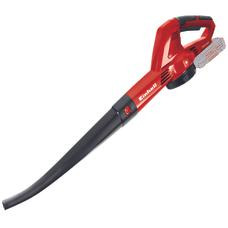 If you want to spare the nerves and ears of your neighbors, the quiet, light and user-friendly cordless leaf blower from our Power X-Change series is the choice. This is a powerful and reliable tool which enables the quick and user-friendly cleaning of open areas and niches. For garden care professionals requiring a particularly powerful tool with a long operating time, on the other hand, the petrol leaf blower is the preferred choice.